Since 1950, the Korean peninsula has been torn apart by war, with the threat of violent conflict constantly looming on both sides of the demilitarized zone. 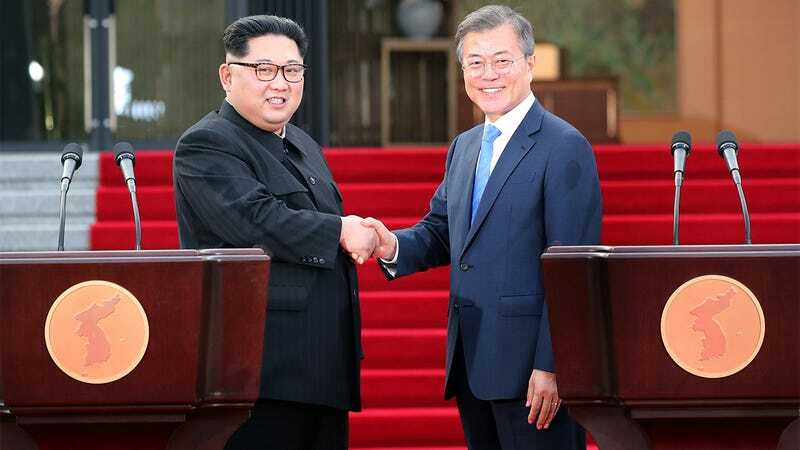 But now, North and South Korea have finally decided to put their differences aside, and the two countries are already taking massive strides to build a new and lasting diplomatic relationship: After formally ending their 65-year war, North and South Korea have teamed up to invade Italy. So powerful. It looks like peace has come to the Korean Peninsula at last. Following a meeting at the 38th parallel north, where leaders of each country agreed to a peace treaty, North Korean Supreme Leader Kim Jong-un and South Korean President Moon Jae-in joined hands to announce that the militaries of both Korean nations were currently marching across the Alps and determined to conquer Italy one region at a time. The strength of this newfound partnership is undeniable, with the typically adversarial Kim Jong-un claiming that Italy’s land has always belonged to the Korean people, and that his armed forces will proudly march alongside South Korea’s in harmony until every inch of Italy, from the snow-capped mountains of northern Piedmont to the serene cliff-side vistas of the southern Amalfi Coast, had become designated as Korean territory. In a moving gesture of friendship, Moon Jae-in then smiled at Kim Jong-un before announcing that the years of violence between their two nations were officially over, and together North and South Korea would support one another as they slaughtered any Italian freedom fighters who opposed them. “My friend, I cannot wait until we are standing arm in arm, watching our soldiers raise the flags of our two noble nations high above the newly founded Korean Republic of Italy,” President Moon said with tears in his eyes. The two men then embraced as a large television screen behind them began to play live footage of North and South Korean soldiers driving tanks through the streets of Venice. Absolutely beautiful. For two countries that have been at odds for more than half a century, it can’t be overstated just how amazing it is to see them act as one team to plunder Italy and claim its people and resources as their own. It just goes to show that when warring nations work together instead of against each other, anything is possible. Which One Of My Enchanted Marionettes That Love North Korea And America The Same Amount Are You?